Home Updates/News A Defining Moment? 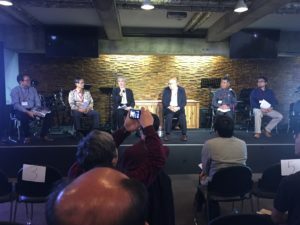 In October 2018 about 100 Japanese leaders gathered in Nagoya Japan for the 5th Church Multiplication Vision Festival (Festa). I really feel that this meeting was a watershed event. What made this Vision Festa a defining moment in the church in Japan? I share with you my impressions. Throughout Vision Festa the message was clear. What we want to see happen in multiplying the church in Japan is not humanly possible. But God loves Japan and has a hand on Japan. God is answering prayer as we work together for the Kingdom. God assures us that the harvest is plentiful, and we work because God is with us. It is not about us, it is about God and what he desires for Japan. It is God’s might, His Spirit, and His vision that assures it will happen and it is happening before our eyes. These meetings were refreshingly extra-ordinary. Normally when workers and leaders gather in Japan they seem discouraged, doubtful, and needing major encouragement. Many begin talking about how difficult it is and all the reasons why the church does not advance. Here I knew something was different even extraordinary. Two key leaders – one a pastor and network leader and another a seminary professor – both began speaking positively about church multiplication and how it could be done. This was the exact opposite of what I expected. This meeting was full of people with faith, hopeful expectation, and can-do anticipation. 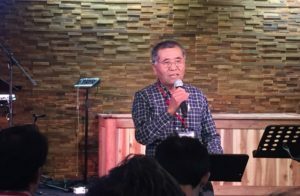 One evening we had a prayer time along with three testimonies of God advancing church multiplication and transformed lives including one “Buddhist temple son.” Surprisingly all three examples were of rural church planting multiplication, often considered the hardest in Japanese soil. Some think that if it will work in rural areas it will work anywhere. (For more details on these stories see an additional article God Advancing Church Multiplication. As a closing speaker mentioned this was really a Festival (matsuri) of Vision. We were all caught up in this atmosphere of belief in God for Japan. My own small group of two Bible school students, and three pastors (from various generations) all believed the vision and the possibilities for each of them to multiply churches. Several years ago at one Vision Festa the grand idea of 50,000 churches was shared. Over the years, many leaders have prayed, considered, and discussed this grand vision. At this Vision Festa I believe everyone has adopted it as a shared national vision. They believe God that they can plant the 50,000 churches needed to saturate Japan and reach the world’s second largest unreached people group, the Japanese! See the other article Why Japan Needs 50,000 churches. Vision Festa was not blindly adopting some unrealistic goal but actually putting thinking caps on and carefully considering the concrete realities of seeing the vision accomplished. Presentations, panels, small group discussions were all designed to address the practical challenges of the task. These challenges would be met head on with “risk-taking” faith and creative energy. The theme of this Vision Festa was “developing healthy leaders for healthy multiplying churches.” If we have a vision to establish 50,000 new churches, we will need 50,000 workers trained and equipped. How do we train these workers? Church leadership in Japan is blessed with many who have had formal Bible school and seminary training. Yet this type of expensive and lengthy formal training cannot prepare enough workers for the harvest. 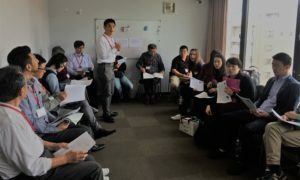 While still using formal training, this Vision Festa also considered informal training like seminars and study programs (this is CPI’s niche) and non-formal training like discipling, coaching and mentoring. Many came away with new ways to raise up more leaders for the harvest. 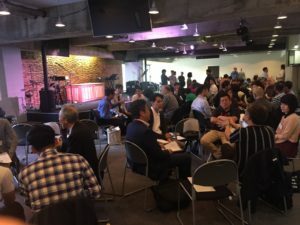 Starting just a few years ago, Vision Festa has grown into a broad-based, evangelical movement of pastors, church leaders, and lay-people from various denominations, independent churches, and ministry networks from all over Japan. There is much to learn from each other and much we can do to encourage one another in church multiplication. As the movement grows, more regions, churches, and leaders will join as well increasing more relationships.